Hiddush - Record support for freedom of choice in marriage! 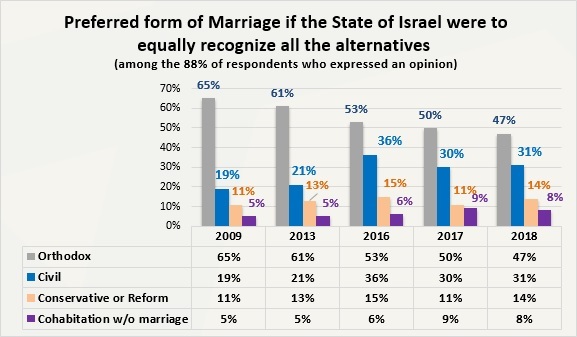 The percentage of public support for the recognition of freedom of choice in marriage in Israel has continued to increase steadily. Further, the majority of the adult Jewish public now prefers to marry outside the Chief Rabbinate. These results arose from a special survey conducted by the Rafi Smith Polling Institute in honor of the Jewish holiday of Love - Tu b'Av - for Hiddush - Freedom of Religion for Israel, Inc. last week. The survey was conducted on July 19-23, 2018 by telephone among 800 respondents, a representative sample of the adult Jewish population in Israel, with a sampling error of ± 3.5%. The survey was made possible with support from the Israel Religious Expression Platform (IREP) on behalf of the Jewish Federations of North America. The percentage of public support for official, equal recognition of marriage alternatives by the State of Israel, measured annually in Hiddush's surveys, increases every year. When Hiddush was established in 2009, public support was at 53%. Today, in 2018, it stands at 70%. At the same time, the percentage of those who expressed their desire to have Orthodox wedding ceremonies if the State of Israel were to recognize alternatives to marriage via the Chief Rabbinate continued to decline steadily from 65% in 2009 to only 47% today. Further, there was an increase in expressed public preference for getting married in civil wedding ceremonies, assuming that it were available in Israel, from 19% in 2009 to 31% today. 14% of the public would prefer to marry in a Conservative or Reform wedding. The tremendous, unequivocal public support for the elimination of the monopoly of the Chief Rabbinate over marriage for Jews in Israel is encouraging. It will not be long before change comes to the political and legal arenas as well. As we saw earlier this week, the public is losing patience with their political leaders' obstinacy and their perpetual concessions to the dictates of the ultra-Orthodox parties. This phenomenon will increase and expand in relation to other issues, such as Shabbat, equality of civic burden, and exclusion of women from the public sphere. A majority of voters for all non-Haredi parties in the government coalition want freedom of marriage, and a growing percentage of the Orthodox public supports freedom of choice. Many of them choose to marry outside the auspices of the Chief Rabbinate. Revolution on the way, and we fully expect that these trends will be reflected in the upcoming municipal and Knesset elections, so those political players who wish to perpetuate state-enforced religious coercion will pay the political price. It is no longer possible to accept the fact that the State of Israel is the only Western democracy in the world that denies its citizens the freedom of marriage, nor that hundreds of thousands of Israeli citizens are denied the right to establish a family in their own country! The Hiddush survey also examined the marriage preferences of Israel's Jewish public today, while alternatives are not yet recognized by law, and those couples who choose alternative marriage routes are only entitled to the status of "common-law spouses" that are only partially entitled to the rights and obligations of married couples. This question also included a reference to the growing phenomenon of Orthodox marriage outside the Chief Rabbinate. Only 33% responded that they are not interested in an alternative to marriage via the Chief Rabbinate! The rest were divided as follows: 18% - prefer an Orthodox ceremony outside the established Rabbinate[! ], 27% - a secular ceremony, 14% - a Reform or Conservative ceremony, and 8% - cohabitation without marriage. 1. Do you support the recognition of freedom of choice in marriage in Israel? "As of today, marriages and divorces of Jews in Israel are performed only according to Orthodox law. Do you support or oppose Israel recognizing all forms of marriage, including Conservative, Reform and civil marriages?" The data show that even among those who define themselves as Orthodox, 22% support the State of Israel recognizing not only weddings via the official Rabbinate but also other alternatives. Most of the traditional public supports freedom of choice in marriage: 58% of those who define themselves as "traditional - close to religion," and 84% of the "traditional - not so close to religion" [According to the definition of the Central Bureau of Statistics]. As expected, 92% of the Jewish secular public supports freedom of choice in marriage! It should be emphasized that freedom of choice in marriage enjoys the support of the majority of voters for the non-Haredi coalition parties: 72% of Likud voters in the 2015 elections, 78% of Kulanu voters, 82% of Yisrael Beiteinu voters, and even 55% of Jewish Home voters. "The State of Israel today recognizes marriages of Jews in Israel only if they are conducted within the framework of the Chief Rabbinate, but also partially recognizes the rights and obligations of 'common-law couples'. A number of organizations offer alternatives of Jewish-egalitarian marriage outside the Rabbinate, which allow couples to be recognized as 'common-law.' In principle, would you prefer for yourself or for your children one of the alternatives to marriage via the Chief Rabbinate? If so - which one of these: An Orthodox ceremony outside the official Chief Rabbinate; a Reform or Conservative ceremony; a secular ceremony; Cohabitation as 'common law' without marriage; or - I do not want an alternative to marriage via the Chief Rabbinate." While 72% of women do not want to marry via the Chief Rabbinate, among men, only 62% are not interested in marriage via the Chief Rabbinate. 22% of the Orthodox prefer Orthodox ceremonies outside the Chief Rabbinate, and this is also the preference of 32% of "traditional - close to religion" Jewish Israelis! As for the secular, 90% [!] Prefer to marry outside the Chief Rabbinate. 47% of secular Israelis prefer a secular ceremony, 19% - a Reform or Conservative ceremony, and 13% - an Orthodox ceremony outside the established Rabbinate. 15-17% of the traditional public [both religious traditional and non-religious traditional] expressed a preference for a Reform or Conservative ceremony. 65% of Likud voters in the 2015 elections, 81% of Kulanu voters, and 85% of Yisrael Beitenu voters prefer an alternative to marriage via the Chief Rabbinate! Among the Jewish Home voters, 58% do not want an alternative to the Chief Rabbinate today, and the rest prefer one of the alternatives: [19% - an Orthodox ceremony outside the official Rabbinate, 6% - a Reform or Conservative ceremony, 12% - secular ceremony, and 5% - prefer living together without marriage.] 22% of Yesh Atid voters and Kulanu voters prefer a Reform or Conservative ceremony, as is the preference of 17% of Likud voters. A preference for a secular ceremony was expressed by 47% of Yisrael Beiteinu voters, 41% of Yesh Atid voters, 32% - the Zionist Union, 29% - Kulanu, and 22% of Likud voters. 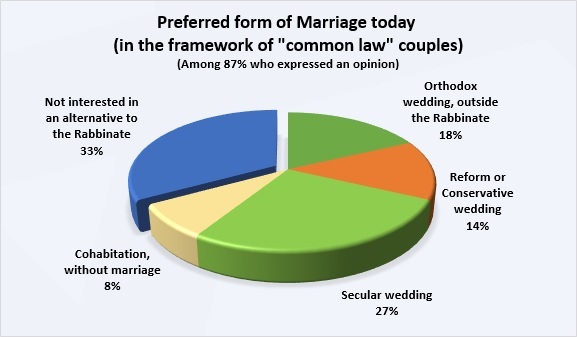 "Assuming that all the following options are available and are equally recognized by law, should you or any of your children want to marry - what framework would you choose for marriage: Orthodox; Conservative or Reform; Civil marriage; Cohabitation without official marriage"
More men [52%] than women [43%] would prefer to marry in an Orthodox wedding ceremony. 28% of men and 34% of women would prefer to marry in a civil wedding. Israeli Jews who are "traditional - close to religion" - 71% would prefer to marry in Orthodox weddings, 9% in Reform or Conservative weddings, and 15% in civil weddings. "Traditional - not so close to religion" - Only 49% would prefer an Orthodox wedding, 23% - Reform or Conservative weddings, and 21% - civil marriage. These data reaffirm the significant difference between the positions of these two subgroups among the "traditional" public. Secular - only 18% of secular Israeli Jews would prefer to marry in Orthodox marriages. The rest would prefer one of the alternatives: 52% - civil marriage, 18% - Conservative or Reform marriages, and 11% - cohabitation without marriage. Likud voters - Only 52% of Likud voters would prefer to marry in Orthodox weddings if all the alternatives to the marriage were recognized equally, 13% - Reform or Conservative marriages, 26% - civil weddings. Only 39% of Kulanu voters would prefer Orthodox marriages, as would 30% of Yisrael Beiteinu voters, 25% of Zionist Union voters, and 21% of Yesh Atid voters. Among voters for the Jewish Home, 75% would prefer Orthodox weddings, but 19% would prefer civil marriage. Preference for Reform or Conservative Marriage, if they were recognized equally: 29% of Yesh Atid voters express a future, 23% - Kulanu, and 22% - Yisrael Beiteinu.